Is it possible to have the same preference options to show icon , text or both? i think there needs to be a launchpad page / wiki to showcase the app indicators, so others dont go and duplicate them. It is possible and simple to realize, but an icon seems to be the standard way of displaying indicator statuses. On the other hand, cpufreq GHz are fun to read. So that sounds reasonable to do. Are you planning to update this for Precise? Also, there is a problem with the indicator in that it will not work with a non-default theme - because it requires the icon theme to include the necessary images (you can solve this by including some default images). I would have asked you on launchpad, but I found this blog post first. The indicator is already available for Precise in the universe repository. 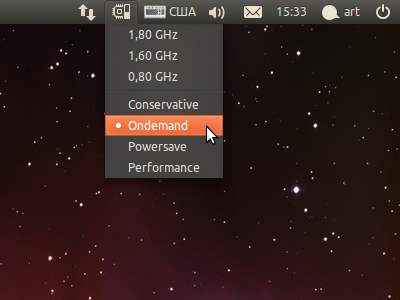 And yes, the problem with the non-default icon themes will be fixed (very likely by an Ubuntu-neutral icon theme).